Rubicon Express rear brakeline - 22"
Rubicon brake lines are as good as they get. We build them to last. 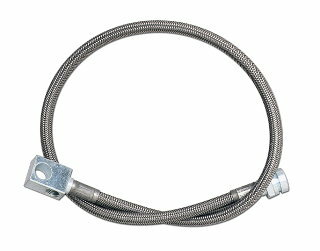 Features are thick stainless steel outer casing riding on a rubber casing outside a kevlar casing housing a Teflon inner hose. Mounting brackets included where necessary. So don’t neglect your brakes. Always properly bleed system after installation and verify that brake lines do not contact tires, moving suspension components and that length is sufficient for full travel. Built to DOT specifications.